There are many more questions than answers over a controversial logging project at Collingwood Bay in Northern Province. The logging company, Northern Forest Products Limited, started operations in 2017 and currently has some 5,300 cubic metres of logs stockpiled at Wanigela awaiting export to China, according to its export permit application. Northern Forest Products Limited says the logging operation has all the necessary government approvals and is fully legal. It says it is engaged in a legitimate agro-forestry project in partnership with a local company, Aisor Development Corporation, and will be planting cocoa and other tree crops once the forest is cleared. 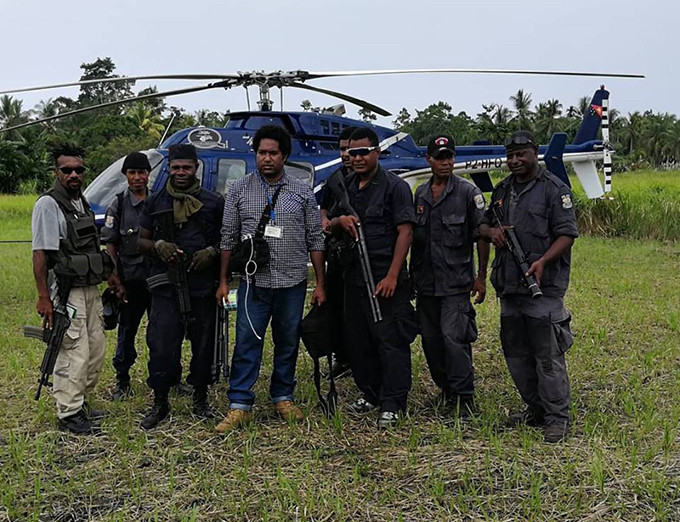 The legality of the logging operation has though been questioned by the Managing Director of the PNG Forest Authority, Tunou Sabuin, his Minister, Douglas Tomuriesa, Oro Governor, Gary Juffa, and by the police. In the latest development, it is reported at least 13 logging company workers have been arrested for alleged immigration breaches and the logging equipment and stockpiled logs have been impounded by the police. Sabuin, meanwhile, appears to have had a change of heart and is now defending the logging company’s right to continue its operations. In a Ministerial Brief, dated 15 February, Tunou Sabuin says the logging permit granted to Northern Forest Products was incorrectly issued. The brief was written in response to allegations raised in Parliament by Gary Juffa that the logging in Collingwood Bay was illegal . In the Brief, Sabuin states that although a Forest Clearance Authority (FCA) was issued to Northern Forest Products Limited on 3 July 2017 and signed by the Chairman of the National Forest Board, ‘proper process was not followed’. 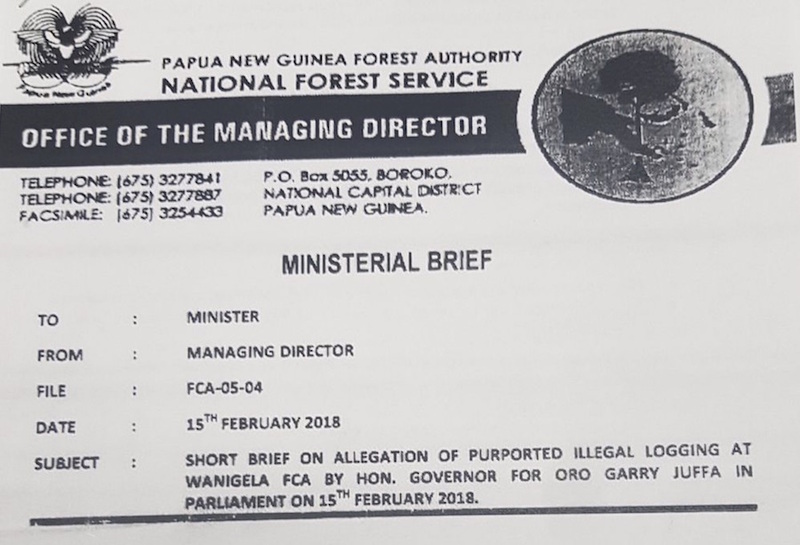 Sabuin states that no public hearing on the FCA application was held as required under the Forestry Act, the Oro Provincial Forest Management Committee did not approve the application until after the FCA was already granted and the performance bond imposed, K100,000, ‘does not match the magnitude of the proposed operation’. According to the Brief, the Forest Authority was cancelling the FCA, the log export application had been rejected and the stockpiled timber was to be seized. These findings mirror comments attributed to the Forest Minister, also in response to Governor Juffa’s questions about the Collingwood Bay logging. 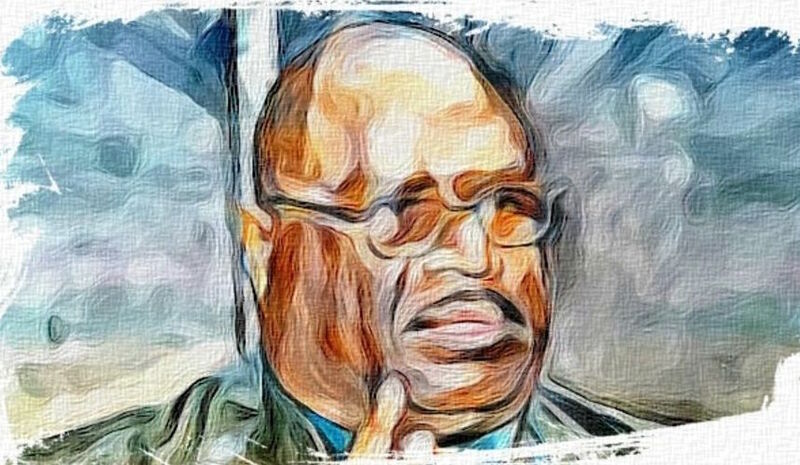 The Minister is reported to have told Parliament* he was aware of a particular individual who had been conducting illegal logging operations in Madang and Kimbe and evading the law had now moved into Northern Province. The Minister said the Forest Authority was dealing with the situation. * Unfortunately hyper-links to the Post Courier newspaper are not accessible to readers in PNG. This is a general restriction imposed by the Post Courier which doesn’t allow PNG residents online access to the publication. Despite what he wrote in the Ministerial Brief, according to a media report*, Tunou Sabuin now says the Collingwood Bay logging operation is not illegal and will not be shut down. Instead, Northern Forest Products is being fined K150,000 for ‘technical oversight of harvesting procedures’ and the export of the stockpiled logs has been approved. Sabuin now says the FCA was properly issued by the National Forest Board which was entitled to step in and give its approval when the Provincial Forest Management Committee (PFMC) failed to meet and deliberate on the proposal. This assumption of the powers of the PFMC by the National Forest Board was possible, says Sabuin, because the PFMC is a subcommittee of the main board. Is it correct the National Forest Board (NFB) can step in an assume the function and powers of a Provincial Forest Management Committee at will? This is a legal question that requires expert adjudication but it is not supported by a lay reading of the Forestry Act. The statute does allow the NFB, with 14 days notice given in writing, to suspend a PFMC [S.25] and the PFMC, by notice in writing, may delegate its function to the NFB [S.30(2)] but neither of those provisions allow the National Board to simply step in and make a decision on behalf of a PFMC, as is claimed occurred in the Collingwood Bay case. Whatever the legal position on the NFB taking over the role of the PFMC, it is also not clear why Sabuin and the Forest Authority now appear to be overlooking the failure to hold a public hearing on the FCA application, as revealed by Sabuin in his earlier brief. There are also legitimate questions as to whether there were any other breaches of proper process under the Forestry Act in issuing the FCA. Section 90 of the Act seem to impose, amongst other detailed requirements, public tendering and approval from the National Executive Council before an FCA for agricultural clearance can be issued. There is no evidence these steps were followed. While the Forest Authority seems to be wavering over the legality of the logging at Collingwood Bay, Oro Governor, Gary Juffa, seems to have no such doubts and has taken his own decisive action in conjunction with the police. According to media reports* and social media posts from the Governor, police have raided the Northern Forest Products logging camp, shut down the logging operation, seized the equipment, arrested 13 Asian employees and charged the site manger with stealing logs. It is alleged the arrested employees, from Malaysia and Indonesia, do not have valid entry permits or work visas and were illegally employed. Gary Juffa has given an interview on Radio New Zealand encouraging other Governors to take direct action against illegal logging operations. PNGi can also reveal there are question marks over the status of Aisor Development Corporation Limited, the local company that Northern Forest Products says it is in partnership with. Northern Forest Products and the Forest Authority both refer to Aisor as a ‘landowner company’. The concept of a ‘landowner company’ has no official status in PNG law but it is a designation that is often used to denote a company that represents customary landowners through a broad share ownership. Assor Developments though is 88% owned by one man, John Dumare. As a director and majority owner of Aisor Development Corporation, John Dumare has failed in his duty to ensure the company files its Annual Returns. No returns have been lodged by the company since 2010. John Dumare has also featured in previous attempt to illegal acquire and log the forests of Collingwood Bay. In 2014, customary landowners from Collingwood Bay successfully challenged two Special Agriculture and Business Leases granted to Sibo Management Limited and Wanigela Agro Industrial Limited. The National Court declared the leases, covering some 38,000 hectares of forest, null and void as they had been unlawfully issued without following proper process and without landowner consent. John Dumare was a shareholder in Wanigela Agro Industrial Limited, one of the leaseholders whose lease was declared unlawful. Attempts to log the forests of Collingwood Bay date back even further. In 2002, Maisin and Wanegela landowners celebrated another court victory after successfully challenging an earlier lease also granted unlawfully for logging and oil palm planting over the same area of forest. Industry observers say that the confusion over the legality of logging in Collingwood Bay and the changing position of the Managing Director of the Forest Authority, could be evidence of an alleged split that has been developing between the staff of the National Forest Service and the National Forest Board. According to this theory, it is suggested the Board, under the control of Ministerial appointee, David Dotaona, is increasingly taking a lead in making its own decisions in authorising logging operations rather than following the advice of the National Forest Service and this may be leading to a failure to follow proper process. It this is true, then unfortunately for Mr Sabuin, he would appear to be at the crux of that split as the link between the Board and the staff of the National Forest Service. Gary Juffa is less circumspect. He claims corrupt public servants in the Forest Authority have been helping facilitate fraud and the theft of forest resources for decades. “PNGFA is in fact failing miserably in its mandate and is assisting transnational criminal cartels steal our forest resources. Every month, shipments worth millions leave our shores…forest resources obtained under pretext and fraud, leaving behind destroyed landscapes, polluted waterways and miserable landowners who have either been fooled or contemptuously mistreated and intimidated by corrupt elements of the public service and Police”. The controversy over logging in Collingwood Bay also points, once again, to the apparent willingness of authorities in Papua New Guinea to sanction large-scale resource extraction projects without first taking the steps to ensure the free informed consent of customary landowners whose rights are supposedly protected in law and properly follow all the mandated legal steps. This propensity can lead to a lot of anger and suffering at a local level across communities impacted by oil and gas extraction, mining and logging but rarely seems to affect the status or profits of the main beneficiaries, the foreign owned resource-extraction companies.